Handheld retro gaming machines come and go, but few go so simply and effectively to the point as My Arcade’s Retro Champ. You stick in your NES cartridge, hit the power button and, assuming you blew on it beforehand, it powers up. This one sets itself apart with a big ol’ screen, Famicom compatibility and a whopping 35-hour battery life. Update: Nope! It’s 3 to 5 hours, not 35 as the company originally stated. I thought that was suspiciously high. 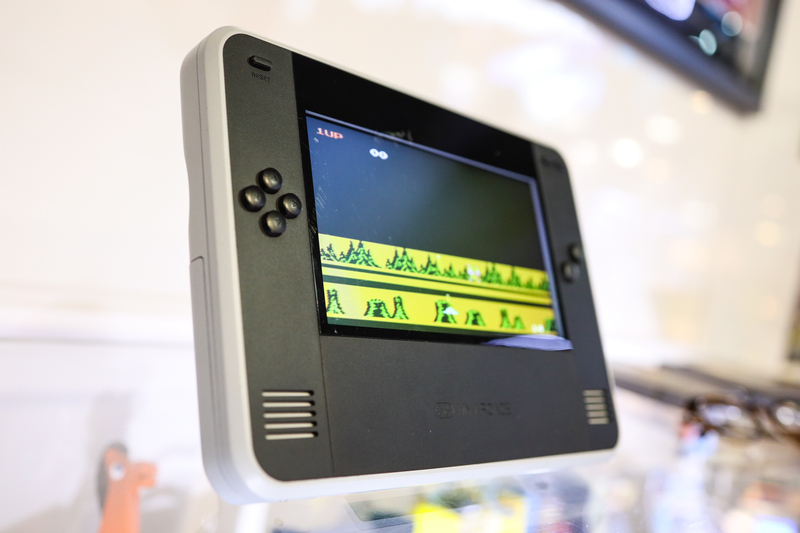 I played with the Retro Champ at CES, where they had one under lock and key — it’s not the production version, but that’s coming in the Spring. But it works just like you’d expect, and I was pleased to find it responsive, comfortable and pleasantly ridiculous. It’s really quite big, but not nearly as heavy as it looks. The 7-inch screen is bright and the color looked good; it was responsive and the device felt well-balanced. The controls are where you’d expect, with big scoops in the back of the case to help you grip it. NES cartridges go in the top (and stick out as you see) and Famicom cartridges tuck in the bottom. 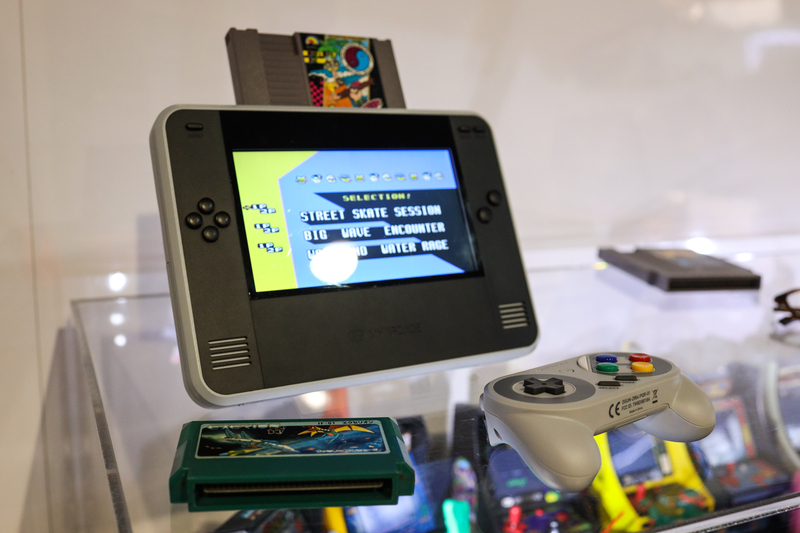 There’s a stand so you can prop it up and use wireless controllers with it (not included; they’re trying to keep the price low), and you can also plug it straight into your TV via HDMI, which basically makes this thing a spare NES home console. The screen is low-resolution, but that’s fine for NES; and its 480p output won’t wow anyone, but again, this is a Nintendo we’re talking about. The original outputs via RF adapter. Lastly (and hilariously), there’s a hidden cleaning kit with space for a few Q-tips and a small bottle of solvent, for getting those really grimed-up games working. Yes, it’s a 16:9 screen, and of course NES games were 4:3. So yes, you’ll be able to change that. And no, it’s not just loading the ROM data into an emulator. This is the common way of doing it, and it produces artifacts and incompatibility with some games, not to mention control lag and other issues. Things have gotten better, but it’s definitely corner-cutting. I chatted with Amir Navid, the creative director and one of the developers of the device. Though he couldn’t get into the technical details (patents pending), he said that they had developed their own chip that runs the game the same way an actual NES would. So any cartridge that works on the NES, including homebrew and hacked games, will load right up no problem. That means you can also use a cartridge with an SD card loader, like an Everdrive, for those hard-to-get and hacked titles. Some features are up in the air, for instance save states. It’s possible, but because this is in effect just a small Nintendo and not a virtual one, it’s also tricky. We’ll see. I was also curious why there were four round buttons instead of the traditional NES D-pad. Navid said they were still waiting on feedback from players about which worked best; for an actual controller, the original D-pad might be good, but perhaps not for the handheld style. So they’re considering a few configurations; likewise the buttons on the right — they could get some tweaking before release. The device goes for $80, which seems fair to me. If you want absolute fidelity for a home console, you can spend five to 10 times that amount, while for handhelds there are cheaper and smaller devices out there, most of which use emulators. They’re aiming for enthusiasts who want an easy but uncompromised way of playing their cartridges — lots of us have consoles sitting in boxes, but it’s a pain to get them set up. The Retro Champ could be one of the easiest ways to get back in the game. It ships in June.